10 bright LEDs, built-in Rechargeable Lithium Battery. AC adapter and USB cord included. One Button Control: easy access power switch behind to power on/off and control two brightness levels. Widely Used: suitable for music stands, pianos, orchestra pits, desks, tables, dark clubs, etc. 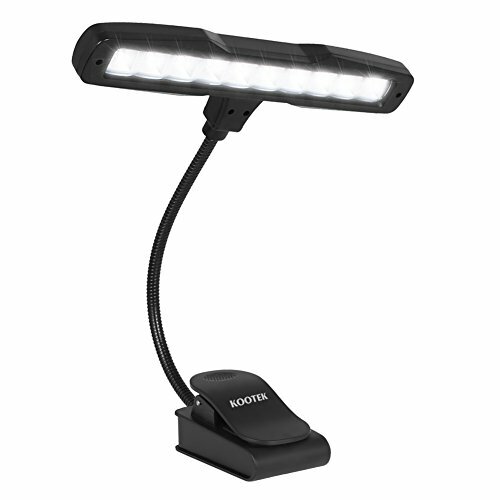 2-IN-1: it can stand on desk with the base as normal desk lamp and also available to clip almost anywhere and any angle with its anti-skid clip. It can be powered by built-in battery so it's wireless and portable. You can take it move around in your house or take it with you while travelling.